"Sugar Land" redirects here. For other uses, see Sugar Land (disambiguation). Sugar Land is a city in Fort Bend County, Texas, United States, located in the southwestern part of the Houston–The Woodlands–Sugar Land metropolitan area. Located about 19 miles (31 km) southwest of downtown Houston, Sugar Land is a populous suburban municipality centered around the junction of Texas State Highway 6 and U.S. Route 59. Beginning in the 19th century, the present-day Sugar Land area was home to a large sugar plantation situated in the fertile floodplain of the Brazos River. Following the consolidation of local plantations into Imperial Sugar Company in 1908, Sugar Land grew steadily as a company town and incorporated as a city in 1959. Since then, Sugar Land has grown rapidly alongside other edge cities around Houston, with large-scale development of master-planned communities contributing to population swells since the 1980s. Sugar Land is one of the most affluent and fastest-growing cities in Texas. Its population increased more than 158% between 1990 and 2000. Between 2000 and 2007, Sugar Land also saw a 46% increase in jobs. As of the 2010 census, the city's population was 78,817. Following the annexation of the Greatwood and New Territory communities in December 2017, the city's population was estimated at 118,118 as of January 1, 2019. Sugar Land is home to the headquarters of Imperial Sugar; the company's main sugar refinery and distribution center were once located in the city. The Imperial Sugar crown logo is featured in the city seal and logo. Prior to the founding of Texas, the Atakapa people lived in the area that would later become Sugar Land. Sugar Land has roots in the original Mexican land grant made to Anglo-American Stephen F. Austin. One of the first settlers of the land, Samuel M. Williams, called this area Oakland Plantation because many different varieties of the trees were on the land, such as willow oak, post oak, water oak, southern red oak, and live oak. Williams' brother, Nathaniel, purchased the land from Austin in 1838. They developed the plantation by growing cotton, corn, and sugarcane. During these early years, the plantation was the center of social life along the Brazos River. In 1853, Benjamin Terry and William J. Kyle purchased the Oakland Plantation from the Williams family. Terry is known for organizing a division of Texas Rangers during the Civil War and for naming the town. Upon the deaths of Terry and Kyle, Colonel E. H. Cunningham bought the 12,500-acre (5,100 ha) plantation soon after the Civil War. He had a sugar-refining plant built here, and developed the town around it in 1879, platting the land and attracting settlers during the post-Reconstruction era. In 1906, the Kempner family of Galveston, under the leadership of Isaac H. Kempner, and in partnership with William T. Eldridge, purchased the 5,300-acre (2,100 ha) Ellis Plantation, one of the few plantations in Fort Bend County to survive the Civil War. The Ellis Plantation had originally been part of the Jesse Cartwright league; Will Ellis had operated it after the Civil War by a system of tenant farming, made up mostly of African-American families who had earlier worked the land. In 1908, the partnership acquired the adjoining 12,500-acre (5,100 ha) Cunningham Plantation, with its raw-sugar mill and cane-sugar refinery. The partnership changed the name to Imperial Sugar Company; Kempner associated the name "Imperial", which was also the name of a small raw-sugar mill on the Ellis Plantation, with the Imperial Hotel in New York City. Around the turn of the 20th century, most of the sugarcane crops were destroyed by a harsh winter. As part of the Kempner-Eldridge agreement, Eldridge moved to the site to serve as general manager and build the company-owned town of Sugar Land. The trains running through Sugar Land are on the route of the oldest railroad in Texas. They run adjacent to the sugar refinery, west of the town, and through the center of what used to be known as the Imperial State Prison Farm. It operated with convict lease labor. Between the end of the civil War and 1912, more than 3,500 prisoners died in Texas as a result of the racist convict leasing program. Archaeologists have uncovered unmarked graves of African Americans from this period in the region around Sugar Land's prison and sugar factory. Since the early 21st century, this area has been largely redeveloped as the suburban planned community of Telfair. As a company town from the 1910s until 1959, Sugar Land was virtually self-contained. Imperial Sugar Company provided housing for the workers, encouraged construction of schools, built a hospital to treat workers, and provided businesses to meet the workers' needs. Many of the original houses built by the Imperial Sugar Company remain today in The Hill and Mayfield Park areas of Sugar Land, and have been passed down through generations of family members. During the 1950s, Imperial Sugar wanted to expand the town by building more houses. It developed a new subdivision, Venetian Estates, which featured waterfront homesites on Oyster Creek and on man-made lakes. As the company town expanded, so did the interest of establishing a municipal government. Voters chose to make Sugar Land a general-law city in 1959, with T. E. Harman becoming the first mayor. In the early 1960s, a new subdivision development called Covington Woods was constructed. Later that year, the Imperial Cattle Ranch sold about 1,200 acres (490 ha) to a developer to create what became Sugar Creek in 1968. As a master-planned community, Sugar Creek introduced the concept of country club living to Sugar Land. Custom houses were built to surround two golf courses, and country clubs, swimming pools, and a private home security service were part of the amenities developed. The success of Sugar Creek, buoyed by the construction of U.S. Highway 59, quickly made Sugar Land's vast farmlands attractive to real estate developers for residential housing. In 1977, development began on First Colony, a master-planned community encompassing 10,000 acres (4,000 ha). Developed by a Gerald Hines-led consortium that became known as Sugarland Properties Inc., development on First Colony would continue over the next 30 years. The master-planned community offered homebuyers formal landscaping, neighborhoods segmented by price range, extensive green belts, a golf course and country club, lakes and boulevards, neighborhood amenities, and shopping. Around the same time as First Colony, another master-planned community development called Sugar Mill was started in the northern portion of Sugar Land, offering traditional, lakefront, and estate lots. The master-planned communities of Greatwood and New Territory, at the time situated west of the city in what was then its extraterritorial jurisdiction, also began to be developed by the end of the 1980s. In addition to the development of master-planned communities targeted at commuters from Houston, Sugar Land began attracting the attention of major corporations throughout the 1980s. Many chose to base their operations in the city. Fluor Daniel, Schlumberger, Unocal, and others began to locate offices and facilities in the city. This resulted in a favorable 40/60 ratio of residential to commercial tax base within the city. In 1981, a special city election was held for the purpose of establishing a home-rule municipal government. Voters approved the adoption of a home-rule charter, which established a mayor-council form of government, with all powers of the city invested in a council composed of a mayor and five councilmen, elected from single-member districts. A special city election was held Aug. 9, 1986, to submit the proposed changes to the electorate for consideration. By a majority of the voters, amendments to the charter were approved that provided for a change in the city's form of government from that of "mayor-council" (strong mayor) to that of a "council-manager" form of government which provides for a professional city manager to be the chief administrative officer of the city. Approval of this amendment authorized the mayor to be a voting member of council, in addition to performing duties as presiding officer of the council. Sugar Land annexed Sugar Creek in 1986, after the latter community was nearly built-out. That same year, the city organized the largest celebration in its history, the Texas Sesquicentennial Celebration, celebrating 150 years of Texan independence from Mexican rule. An amendment on May 5, 1990, changed the composition of the city council, adding a mayor and two council members, each to be elected at-large, to the five-member council. The at-large positions require election by a majority of voters, which reduces representation of any minority interests. Throughout much of the 1990s, Sugar Land grew rapidly. The majority of residents are white-collar and college-educated, working in Houston's energy industry. An abundance of commercial development, with numerous low-rise office buildings, banks, and high-class restaurants, has taken place along both Interstate 69/U.S. Highway 59 and State Highway 6. Sugar Land added to its tax base with the opening of First Colony Mall in 1996. The more than one-million-square-foot (100,000 m2) mall, the first in Fort Bend County, is located at the busiest intersection of the city: Interstate 69/U.S. 59 and State Highway 6. The mall was named after the 10,000-acre (4,000 ha) master-planned community of First Colony. In November 1997, Sugar Land annexed the remaining municipal utility districts of the 10,000-acre (4,000 ha) First Colony master-planned community, bringing the city's population to almost 60,000. This was Sugar Land's largest annexation at the time. Sugar Land boasted the highest growth among Texas' largest cities, per the U.S. Census 2000, when it had a population of 63,328. In 2003, Sugar Land became a "principal" city, recognized in the metropolitan area's official title change to Houston–Sugar Land–Baytown, with Sugar Land replacing Galveston as the second-most important city in the metropolitan area after Houston. The metro area is now officially referred to as the Houston-The Woodlands-Sugar Land metropolitan area. With its population increase, the city needed to attract higher education facilities. In 2002, the University of Houston System at Fort Bend moved to a new 250-acre (100 ha) campus located off the University Boulevard and Interstate 69/U.S. 59 intersection. The city helped fund the Albert and Mamie George Building, and as a result, the multi-institution teaching center was renamed as the University of Houston Sugar Land. In 2003, the Imperial Sugar Company refinery plant and distribution center was closed, but its effect on the local economy was minimal. Sugar Land has become an affluent Houston suburb rather than the blue-collar, agriculture-dependent town it was a generation ago. Many of its lower income residents, including African American workers who at one time made up the majority working sugar cane, have been displaced and have had to seek work and housing elsewhere. The company maintains its headquarters in Sugar Land. The Texas Department of Transportation sold 2,018 acres (817 ha) of prison land in the western portion of Sugar Land to Newland Communities, a developer, by bid in 2003. The developer announced plans to build a new master-planned community called Telfair in this location. 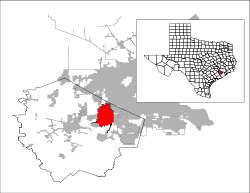 In July 2004, Sugar Land annexed all of this land into the city limits to control the quality of development, extending the city limits westward. This was unusual, since Sugar Land had earlier annexed only built-out areas, not lands prior to development. In December 2005 Sugar Land annexed the recently built-out, master-planned community of Avalon and four sections of Brazos Landing subdivision, adding approximately 3,200 residents. The city eventually annexed the communities of River Park, Greatwood and New Territory, with the latter two being annexed on December 12, 2017, bringing the city proper's population to 117,869. In the 2010s, development began on the Imperial master-planned community, located in undeveloped territory east of Sugar Land Regional Airport and incorporating the former refinery property of Imperial Sugar Company. This development includes Constellation Field, home of the Sugar Land Skeeters minor-league baseball team. Retail needs will be served in the planned Imperial Market development. In 2017, the 6,400-seat Smart Financial Centre concert hall opened its doors. Sugar Land is located in northeast Fort Bend County, 20 miles (32 km) southwest of downtown Houston. It is bordered by Houston to the northeast, and by Stafford, Missouri City, and Meadows Place to the east. According to the United States Census Bureau, the city of Sugar Land has a total area of 34.0 square miles (88.1 km2), of which 32.4 square miles (83.9 km2) are land and 1.6 square miles (4.2 km2), or 4.82%, are covered by water. The elevation of most of the city is between 70 and 90 feet (21 and 27 m) above sea level. The elevation of Sugar Land Regional Airport is 82 feet (25 m). Sugar Land is located at 29°35′58″N 95°36′51″W﻿ / ﻿29.599580°N 95.614089°W﻿ / 29.599580; -95.614089 (29.599580, −95.614089). Sugar Land has two major waterways running through the city. The southwestern and southern portion of the city were developed along the Brazos River, which runs into Brazoria County. Oyster Creek runs from the northwest to the eastern portion of the city limits and into Missouri City. Sugar Land developers have built many artificial lakes connecting to Oyster Creek or the Brazos River, as part of new master-planned communities. Underpinning the area's land surface are unconsolidated clays, clay shales, and poorly cemented sands, extending to depths of several miles. The region's geology developed from stream deposits from the erosion of the Rocky Mountains. These sediments consist of a series of sands and clays deposited on decaying organic matter that, over time, were transformed into oil and natural gas. Beneath these tiers is a water-deposited layer of halite, a rock salt. The porous layers were compressed over time and forced upward. As it pushed upward, the salt dragged surrounding sediments into dome shapes, often trapping oil and gas that seeped from the surrounding porous sands. The region is earthquake-free. While the neighboring city of Houston contains 86 mapped and historically active surface faults with an aggregate length of 149 miles (240 km), the clay below the surface in Sugar Land precludes the buildup of friction that produces ground shaking in earthquakes. These faults move only very gradually in what is termed "fault creep". Sugar Land's climate is classified as being humid subtropical, featuring long, hot and humid summers, and mild to cool winters. The city is located in the Gulf coastal plains biome, and the vegetation is classified as a temperate grassland. The average yearly precipitation is 48 inches. Prevailing winds are from the south and southeast during most of the year, bringing heat and moisture from the Gulf of Mexico. In the summer time, daily high temperatures are in the 95 °F (35 °C) range throughout much of July and August. The air tends to feel still and the abundant humidity, with dewpoints typically in the low to mid 70s, creates a heat index around 100 each day. Summer thunderstorms are common with 30 to 50% of the days having thunder. The highest temperature recorded in the area was 109 °F in September 2000. Winters in the area are cool and temperate. The average winter high/low is 62 °F/45 °F (16 °C/7 °C). The coldest period is usually in January, when north winds bring winter rains. Snow is almost unheard of and typically does not accumulate. One such rare snowstorm hit Houston on Christmas Eve 2004. A few inches accumulated, but had melted by the next afternoon. The earliest snowfall to occur in any winter fell on December 4, 2009. Sugar Land was ranked as one of the "Top Cities in Texas" for business relocation and expansion by both Outlook Magazine and Texas Business. It has attracted major headquarters from Houston, in addition to other cities. As in the rest of the Greater Houston area, the energy industry presence is large, specifically petroleum exploration and refining. Sugar Land holds the headquarters to Fortune 500 company CVR Energy, Inc. (NYSE: CVI), Western Airways, and NalcoChampion's Energy Services division. CVR Energy was listed as the city's only resident 2012 Fortune 500 company and was ranked No. 5 public company, according to the Houston Chronicle. Sugar Land also has a large number of international energy, software, engineering, and product firms. Sugar Land is home to the headquarters of the Imperial Sugar Company. It was once the home of the company's main (and sole) refinery and distribution center. The refinery and distribution center have been closed since 2003. As of 2015, Schlumberger was the second-largest employer in Sugar Land. In 2015, Schlumberger announced that it was moving its U.S. corporate headquarters to the Sugar Land facility from a Houston office building. The company plans to build new buildings with a scheduled completion time of late 2017. They include a total of 250,000 square feet (23,000 m2) of class A office space and an "amenities" building with 100,000 square feet (9,300 m2) of space. Minute Maid opened its headquarters in Sugar Land Town Square in First Colony on February 16, 2009; previously, it was headquartered in 2000 St. James Place in Houston. In 1991, BMC Software leased about 120,000 square feet (11,000 m2) at the Sugar Creek National Bank Building and about 16,000 square feet (1,500 m2) in the Fluor Daniel Building, both in Sugar Land. BMC planned to vacate both Sugar Land facilities when its current headquarters, located in Westchase, opened; BMC's headquarters were scheduled to open in 1993. The grounds of Sugar Land Fire Department #1 house the City of Sugar Land Fire Department offices, and at one time housed City Hall. Sugar Land operates under the Council-Manager form of government. Under this system, Council appoints the city manager, who acts as the chief executive officer of the government. The city manager carries out policy and administers city programs. All department heads, including the city attorney, police chief and fire chief, are ultimately responsible to the city manager. Some of the strengths of the council-manager form of government as opposed to a strong-mayor form of government include - all councilmembers have equal rights, obligations and opportunities, the power is assigned to the council as a whole, and the city manager must be responsive in providing day-to-day services to citizens. The average tenure nationwide for municipal and county managers is 7.4 years. The City of Sugar Land’s last two city managers have an average tenure of over 13 years. The longevity of Sugar Land’s city managers indicates stability in this form of government. Sugar Land's composition of the City Council consists of a Mayor, four councilmembers to be elected by single-member districts in odd-numbered years and two councilmembers by at-large positions in even-numbered years with the Mayor. All city council positions are officially nonpartisan, and its officeholders are limited to four consecutive terms. The city hall was built as part of the Sugar Land Town Square development in First Colony. Prior to the opening of the current city hall, city hall was located at 10405 Corporate Drive. That space was converted for use by the offices of the Sugar Land Fire Department. Politically, white-majority and affluent residents of Sugar Land make this a strongly Republican area in Greater Houston in the 21st century. While Sugar Land's city council is officially nonpartisan, all of its current elected officeholders are endorsed Republicans. Sugar Land is located in Texas's 22nd congressional district. It is represented in the US House of Representatives by Republican Pete Olson, a former chief of staff to U.S. Senator John Cornyn. The district had long elected former House Majority Leader Tom DeLay, who served from here from 1985 until his 2006 resignation. Previously in 1976, Republicans ran a write-in campaign and gained election of Republican Ron Paul, who served briefly in 1976. He ran for a full term in 1978, serving from 1979 until 1985. In the Texas Legislature, most of Sugar Land is represented in District 17 of the Texas Senate, which is represented by Republican Joan Huffman. Some western segments of the city and its extraterritorial jurisdiction, including the master-planned communities of New Territory, Greatwood, River Park and Telfair, are situated in District 18, represented by Republican Lois Kolkhorst. She succeeded Glenn Hegar in a 2014 special election following the latter's election as Texas State Comptroller earlier that year. In the Texas House of Representatives, most of Sugar Land is located in District 26, which is represented by Republican Rick Miller, a retired United States Navy officer and current Sugar Land businessman. Some parts of the city are also represented by Democrat Ron Reynolds (the Sugar Land Business Park) in District 27 and Republican Phil Stephenson in District 85 (the River Park, Commonwealth and Riverstone communities). The Texas Department of Criminal Justice (TDCJ) operates the Jester State Prison Farm complex (Jester I, Vance, Jester III, and Jester IV) in an unincorporated area near Sugar Land. The TDCJ operated the Central Unit in Sugar Land. The Central Unit was the only state prison within the city limits of Sugar Land. The Sugar Land Distribution Center, a TDCJ men's correctional supply warehouse, was inside the Central Unit compound. In 2011 the TDCJ announced that the prison was closing and would be vacant by the end of August of that year. With the prison's closing, Sugar Land became the first Texas city to have its state prison close without a replacement facility. The United States Postal Service operates the Sugar Land Post Office at 225 Matlage Way and the First Colony Post Office at 3130 Grants Lake Boulevard. As of the census of 2010, there were 78,817 people, 26,709 households, and 21,882 families residing in the city. The population density was 2,432.6 people per square mile (939.4/km2). There were 27,727 housing units at an average density of 855.8 per square mile (330.5/km2). The racial makeup of the city was 52.0% White, 7.4% African American, 0.2% Native American, 35.3% Asian, 0.04% Pacific Islander, 2.3% other races, and 2.8% from two or more races. Hispanic or Latino of any race were 10.6% of the population. There were 26,709 households out of which 40.7% had children under the age of 18 living with them, 70.0% were married couples living together, 8.6% had a female householder with no husband present, and 18.1% were non-families. 15.6% of all households were made up of individuals, and 5.3% were someone living alone who was 65 years of age or older. The average household size was 2.90, and the average family size was 3.25. In the city, the population was spread out with 24.6% under the age of 18, 7.5% from 18 to 24, 23.4% from 25 to 44, 34.0% from 45 to 64, and 10.4% who were 65 years of age or older. The median age was 41.2 years. For every 100 females, there were 98.6 males. For every 100 females age 18 and over, there were 95.6 males. According to the 2014 American Community Survey, the median income for a household in the city was $115,069, and the median income for a family was $132,534. Male full-time workers had a median income of $98,892 versus $60,053 for females. The per capita income for the city was $48,653. About 6.4% of families and 9.9% of the population were below the poverty line, including 13.5% of those under age 18 and 5.5% of those age 65 or over. Sugar Land has the highest concentration of Asians in Texas. Altogether, 35.3% of the city's population is Asian; 10.7% is Asian Indian, 11.5% is Chinese, 4.5% is Vietnamese and 2% is Filipino. As of 2013, about one-third of the Asian population was Indian American, according to Harish Jajoo, a city council member of Indian origin. The Sugar Land area has Indian grocery stores, temples, several mosques and many Ismaili Jamatkhanas. Jajoo stated that the quality of the jobs, schools, and parks attracts people of Indian origin to Sugar Land. Catholics account for over 30% of the city population with 11,998 households registered by St. Laurence, St. Thomas Aquinas, and St. Theresa parishes. Sugar Land has a largely white-collar, university-educated workforce employed in Houston's energy industry. In 2004, the city was named one of the top 100 places to live, according to HomeRoute, a national real estate marketing company which identifies top American cities each year through its Relocate-America program. Cities are selected based on educational opportunities, crime rates, employment and housing data. The magazine started with statistics on 271 U.S. cities provided by OnBoard LLC, a real estate information company. These cities had the highest median household incomes in the nation and above average population growth. 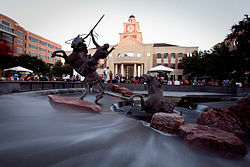 Sugar Land was awarded the title of "Fittest City in Texas" for the population range 50,000–100,000 in 2004, 2005 (in a tie with Round Rock) and 2006. The "Fittest City in Texas" program is a part of the Texas Roundup program, a statewide fitness initiative. Local sports are popular both at the recreational and competitive levels. Sugar Land formed its first community swim team, the Sugar Land Sharks, in 1967, and it is still competing as of 2016. Sugar Land is home to the Smart Financial Centre, an indoor concert hall that is the only such venue of its kind in Greater Houston, and can seat 6,400 seats for multiple events including concerts, cultural events and graduations. An outdoor arts plaza is also being constructed around the concert hall, and will be incorporated with a new mixed-use development that will include two hotels, a conference center, office and ground-level retail, and an age-restricted senior living multifamily complex. Sugar Land is the home of the Sugar Land Skeeters minor-league baseball team, founded in 2010, who play at Constellation Field in the Imperial master-planned community, located between the Sugar Land Regional Airport and the former Imperial Sugar property. The Skeeters won the 2016 championship in the Atlantic League of Professional Baseball, and are the league's only team outside of the Northeast megalopolis. Sugar Land Town Square serves as the primary entertainment district in Sugar Land and Fort Bend County. The district offers an array of restaurants, sidewalk cafes, shopping venues, a Marriott Hotel and conference center, mid-rise offices and homes, a public plaza, and Sugar Land City Hall. Festivals and important events take place in the plaza. The new city hall and public plaza, a cornerstone of Sugar Land Town Square, received the "Best Community Impact" award from the Houston Business Journal at the fifth annual Landmark Awards ceremony. Next door to the district is First Colony Mall, a major regional shopping mall that recently expanded from its original indoor design to include an outdoor lifestyle component, several parking garages, and new signage that blends in with the surrounding area. The mall is anchored by two Dillard's stores, Macy's, JCPenney, and Barnes & Noble, along with over 130 stores. Sugar Land also hosts the Sugar Land Ice and Sports Center (formerly Sugar Land Aerodrome), offers ice skating and hockey lessons. It is open to the public as an ice skating facility. Previously, it served as the practice facility for the Houston Aeros of the American Hockey League. Once a year a music festival called Teenstock is held, which showcases various bands from the area. It is sponsored by the First Colony Association. In May 2016, two sculptures in the Town Square's public plaza were installed as part of a 10-piece collection donated by a Sugar Land resident to the city through the Sugar Land Legacy Foundation. One of the statues, which depicts two girls taking a selfie, has received criticism and acclaim from the media and general public. Future developments in the city include new mixed-use developments on the grounds of the former Imperial Sugar refinery, Imperial Market, which will incorporate the property's 1920s-era char house as a boutique hotel, as well as in the southern part of the Telfair master-planned community with the Smart Financial Centre as an anchor. Sugar Land has the most master-planned communities in Fort Bend County, which is home to the largest number of master-planned communities in the nation—including First Colony, Greatwood, New Territory, Telfair, Sugar Creek, River Park, Imperial, Riverstone and many others. Many of the communities feature golf courses, country clubs, and lakes. The first master-planned community to be developed in Sugar Land was Sugar Creek. There are now a total of thirteen master-planned communities located in Sugar Land's city limits and its extraterritorial jurisdiction combined. The northern portion of Sugar Land, sometimes referred to by residents and government officials as "Old Sugar Land", comprises all the communities north of U.S. Highway 90A, but it also includes the subdivisions/areas of Venetian Estates, and Belknap/Brookside, which is just south of U.S. 90A. Most of this area was the original city limits of Sugar Land when it was incorporated in 1959. Located in this part of town is the former Imperial Sugar Company refinery and distribution center that was shut down in 2003, even though the company's headquarters are still located within the city. To the east of northern Sugar Land is the Sugar Land Business Park, the largest business and industrial area in the city. Many of the city's electronic and energy companies are located here, including the future North American headquarters of Schlumberger. The Imperial master-planned community, including Constellation Field and the future Imperial Market development, is also located in north Sugar Land. The largest economic and entertainment activities are in the areas of south and southeastern Sugar Land. Most of the population in the city limits are concentrated here. This area is all master-planned communities and it includes nearly all of First Colony, the largest in Sugar Land encompassing 10,000 acres (40 km2). Other master-planned communities in this area are Sugar Creek, Sugar Lakes, Commonwealth, Avalon, Telfair, and Riverstone. This area is the location of First Colony Mall, Sugar Land Town Square, the new Sugar Land City Hall, and other major commercial areas. This area boasts a wide range of recreational activities including three golf courses and country clubs, including Sweetwater Country Club (the former home of the LPGA), as well as the Sugar Land Ice & Sports Center (formerly Sugar Land Aerodrome). The southwestern area of Sugar Land was recently annexed into the city limits, and is sometimes referred to as the "other side of the river". This is due to this area being separated from the rest of Sugar Land by the Brazos River, as well as being served by the Lamar Consolidated Independent School District. The southwest side has two master-planned communities, Greatwood and River Park. Other communities in this area are Canyon Gate on the Brazos and Tara Colony, the latter an older large subdivision which has a Richmond address but is actually in the extraterritorial jurisdiction of Sugar Land and up for future annexation. The western portion of Sugar Land was also fully incorporated into the city limits in 2017. It is home to two master-planned communities, New Territory and Telfair, the latter of which was previously prison farm land owned by the Texas Department of Criminal Justice. It was sold in 2003 and annexed to the city limits by Sugar Land in 2004. A new highway, State Highway 99 (more commonly known as the "Grand Parkway"), opened in 1994 as a major arterial in this area. North of this area and U.S. Highway 90A is the Sugar Land Regional Airport and the recently decommissioned Texas Department of Corrections Central Unit, which in 2011 became the first Texas prison to be closed without a replacement facility and is being targeted by the city for future light industrial development. Lakeview Auditorium, located on the campus of Lakeview Elementary School, is the oldest public building still standing in the area. Originally one of eleven buildings that composed the campus of the old Sugar Land Independent School District, the auditorium was a focal point for a vibrant and growing community. The stately auditorium still stands today and is a Recorded Texas Historic Landmark, as of 2002. In 1912, Imperial Sugar Company built a small building at the corner of Wood Street and Lakeview Drive (then known as Third Street) to serve as a school. The original campus consisted of 11 buildings arranged in a semicircle with the large, airy auditorium in the center. The buildings were connected by a covered walkway supported by large, white columns. There was a circular driveway for buses and automobiles. All the buildings were finished in white stucco on the outside and had large windows that allowed fresh air to circulate and cool the buildings. The auditorium was a hub of community activity. Sugar Land currently does not have a mass transit system. However, this could change as it has been a possible candidate for expansion of Houston's METRORail system by means of a planned commuter rail along U.S. Highway 90A. Since many of Sugar Land's residents work in Houston, thus creating routine rush hour traffic along two of the city's main thoroughfares, U.S. Highways 59 and 90A, there has been large support in the area for such a project. The city is not a participant in the Houston area's METRO transit authority; Sugar Land's merchants do not collect the one-cent sales tax that helps support that agency. Fort Bend County Public Transit provides commuter service from Sugar Land to Houston. Interstate 69/U.S. Highway 59, the major freeway running diagonally through the city, has undergone a major widening project in recent years to accommodate the region's daily commuters. The finished portion of the freeway from east of State Highway 6 to just west of State Highway 99 currently has eight main lanes, with two diamond lanes and six continuous frontage road lanes. The freeway is currently undergoing a major expansion west of the city to accommodate growth in the nearby Richmond/Rosenberg area and western Fort Bend County, as well as upgrading it to federal highway standards to reflect its newfound status as an interstate highway. U.S. Highway 90 Alternate is another major highway running through Sugar Land from west to east and traverses a historic area of the city, known as "Old Sugar Land". Originally the main highway in Sugar Land prior to the construction of what is now Interstate 69, U.S. Highway 90A is currently widened to an eight-lane highway with a 30-foot (9.1 m) median between State Highway 6 and Interstate 69/U.S. Highway 59. State Highway 6 is a major highway running from north to southeast Sugar Land and traverses through the 10,000 acres (40 km2) master-planned community of First Colony. There is a freeway section that opened in 2008 from just west of Brooks Street/First Colony Blvd all the way to 3/4 miles north of U.S. Highway 90A. A segment of State Highway 99/Grand Parkway currently traverses the New Territory and River Park master-planned communities. The original highway opened in 1994, with toll lanes added in 2014. Construction will start soon south of its current terminus at Interstate 69/US 59, which is expected to extend the highway east to Alvin in Brazoria County. Texas F.M. 1876, widely known as Eldridge Road, is a north-south state highway in north Sugar Land. It traverses through many established areas and acts as the western border of the Sugar Land Business Park. Sugar Land Regional Airport (formerly Hull Field, later Sugar Land Municipal Airport) was purchased from a private interest in 1990 by the city of Sugar Land. It is the fourth largest airport within the Greater Houston metropolitan area. The airport handles approximately 250 aircraft operations per day. The airport has an on-field United States Customs office, making this airport attractive to energy companies based in the Houston metropolitan area as this allows flights directly to and from countries wherein overseas operations are located, allowing fliers to avoid the delays inherent in high traffic airports such as George Bush Intercontinental. The airport today serves the area's general aviation (GA) aircraft serving corporate, governmental, and private clientele. A new 20,000-square-foot (1,900 m2) terminal and a 60-acre (24 ha) GA complex opened in 2006. Sugar Land Regional briefly handled commercial passenger service during the mid-1990s via a now-defunct Texas carrier known as Conquest Airlines. For scheduled commercial service, Sugar Landers rely on Houston's two commercial airports, George Bush Intercontinental Airport (IAH), 40 miles (64 km) northeast, and William P. Hobby Airport (HOU), 27 miles (43 km) east. The city of Houston maintains a park that occupies 750 acres (300 ha) of land directly north of the Sugar Land Regional Airport, and developers have built master-planned communities (Telfair, and the future development of TX DOT Tract 3 immediately east of the airport) around the airport, both factors that block airport expansion. China Airlines operated private bus shuttle services from Wel-Farm Super Market/Metro Bank on State Highway 6 in Sugar Land to George Bush Intercontinental Airport to feed the flight from Bush Intercontinental to Taipei, Taiwan. The service ended when China Airlines pulled out of Houston on January 29, 2008. The Wharton County Junior College and a branch campus of the University of Houston are both located in Sugar Land. Wharton County Junior College (WCJC) is a comprehensive community college offering a wide range of postsecondary educational programs and services including associate degrees, certificates, and continuing-education courses. The college prepares students interested in transferring to baccalaureate-granting institutions. All public school systems in Texas are administered by the Texas Education Agency (TEA). 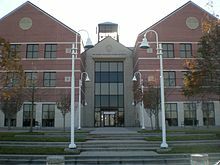 The Fort Bend Independent School District (FBISD) is the school district that serves almost all of the city of Sugar Land; it formed in 1959 by the consolidation of Missouri City Independent School District and the Sugar Land Independent School District. The southwest portion of Sugar Land and some very small areas within its extraterritorial jurisdiction (ETJ) are in the Lamar Consolidated Independent School District (LCISD). LCISD serves the master-planned communities of Greatwood and River Park. Other communities in the ETJ served by Lamar Consolidated include Canyon Gate at the Brazos and Tara Colony. High schools serving Sugar Land residents in Fort Bend ISD include Clements High School, John Foster Dulles High School and Kempner High School, as well as Stephen F. Austin High School north of the city, which serves students in New Territory, while Lamar Consolidated ISD's Lamar Consolidated High School and George Ranch High School respectively serve the River Park and Greatwood master-planned communities in Sugar Land. Dulles, Clements and Austin have been recognized by Texas Monthly magazine in its list of the top high schools in the state of Texas. Dulles offers college preparatory classes such as Organic Chemistry and Multivariable Calculus to the students who are in their Math and Science academy, and has had 64 National AP Scholars in the past 2 years; with a majority from the academy that started in 2010. In addition, Dulles, Clements and Stephen F. Austin high schools were also ranked among the top 1000 schools in the United States by Newsweek's 2009 report. Prior to 1959 Sugar Land High School, which merged into Dulles that year, served the city. At the time FBISD formed, white students attended an elementary school in Sugar Land, a junior high school in Sugar Land, and a high school site in Missouri City. 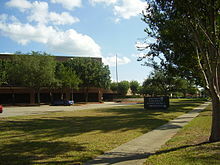 The elementary and junior high campus now houses Lakeview Elementary School and the high school site now houses Missouri City Middle School. Dulles High School became the zoned high school for white students in FBISD. Black students in Sugar Land for grades 1-12 were served by M.R. Wood School, one of FBISD's three schools for black children. 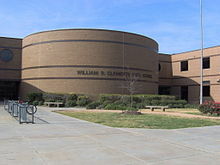 Following racial desegregation in 1965, Dulles became the only zoned high school for students of all races in FBISD until Willowridge High School opened in 1979. In addition, the Harmony Public Schools operates two charter schools in the city, the grades K-6 Harmony Science Academy and grades 7-12 Harmony School of Innovation. There are many private schools in Sugar Land and the surrounding area of all types: non-sectarian, Catholic, and Protestant. The Texas Education Agency has no authority over private school operations; private schools may or may not be accredited, and achievement tests are not required for private school graduating seniors. Many private schools will obtain accreditation and perform achievement tests as a means of demonstrating that the school is genuinely interested in educational performance. The Roman Catholic Archdiocese of Galveston-Houston operates two Catholic K-8 schools in Sugar Land: St. Theresa Catholic School and St. Laurence School, both named for two of the city's Catholic parishes. St. Laurence, established in 1992, received additions in 1996 and 2002. St. Theresa was established in 2008. Some high school students attend Pope John XXIII High School in Greater Katy. The Fort Bend Christian Academy, formerly known as Fort Bend Baptist Academy, and Logos Preparatory Academy are also located in Sugar Land. The Darul Arqam Schools Southwest Campus is located in Houston, near Sugar Land. As of 2019[update] The Village School in the Energy Corridor area; the British International School of Houston in Greater Katy; and Awty International School in Spring Branch, which includes the Houston area's French international school, have bus services to Sugar Land. Residents of Sugar Land are served by the Fort Bend County Libraries system, which has 11 libraries. There are three branches within the city: Sugar Land Branch, First Colony Branch, and University Branch on the University of Houston Sugar Land branch campus. A portion of the 1974 movie, The Sugarland Express, takes place in Sugar Land. Many of the movie's earliest scenes were filmed at the nearby Beauford H. Jester prison pre-release center. Other parts of the set were filmed in and around Sugar Land. The movie's title parses the name of the city as one word rather than two. It was among Steven Spielberg's first films before he became famous. The film was the first theatrical feature film directed by Spielberg. In 2010, The Legend of Action Man was filmed in Sugar Land. The film was produced by Dingoman Productions, a sketch comedy group formed by Sugar Land residents Andy Young, Derek Papa & James McEnelly that got their start attending Austin High School together. The story takes place in the Sugar Land area and makes use of many of the landmarks there. Action Man is famous for being one of the least expensive films ever made, made on a budget of $200. Director Andy Young has written about the experience for Moviemaker Magazine. Folk musician Lead Belly's song "Midnight Special" discusses his arrest in Houston and his stay at the Sugar Land Prison (now the Beauford H. Jester pre-release Center) in 1925. Boy, you better walk right. And you better not squabble. And you better not fight. Bason and Brock will arrest you. Payton and Boone will take you down. That you're Sugar Land bound." Country music band Sugarland gets its name from the city. They reference it in their song "Sugarland." Bruce Springsteen recorded but did not release a song called "Sugar Land," about the economic crisis facing American agriculture in the 1980s. The primary newspaper serving Sugar Land residents is the Houston Chronicle, which is the only major newspaper in the Greater Houston region. On Thursdays, the Houston Chronicle offers a localized segment covering the Sugar Land area under its "Fort Bend" section. An alternative newspaper, the Houston Press, is also offered in this area. Additionally, Sugar Land residents receive local area news coverage via Covering Fort Bend, which covers local news and political happenings in the Sugar Land area. Residents also are served by three free weekly newspapers, the Fort Bend Independent, the Fort Bend Star, and the Sugar Land Sun. The Fort Bend Herald and Texas Coaster, a daily newspaper covering primarily the Richmond-Rosenberg area west of Sugar Land, also covers news stories in Sugar Land. Over-the-air television in Sugar Land is broadcast in the Houston television market, which is the seventh-largest market in the United States according to Nielsen Media Research. The city is also served by a citywide public-access television on cable channel 16, which covers city council meetings, planning and zoning meetings, community events, FBISD board meetings, and Fort Bend County Commissioners' Court meetings. The vast majority of cable subscribers in the Sugar Land area are served by Comcast-owned Xfinity, which took over the Houston area's dominant cable franchise from Time Warner in 2006. Other cable options in Sugar Land include AT&T U-verse, En-Touch Systems (which covers the River Park West and Telfair areas of the city), Phonoscope, TVMAX, and Ygnition (the latter two of which cover cable subscribers in multifamily housing developments). Sugar Land is the setting in the new Lifetime series, The Client List starring Jennifer Love Hewitt. Hewitt's character lives in Beaumont, but commutes to Sugar Land to work at a scandalous massage parlor. Eddie Griffin, deceased NBA player; resided in Sugar Land during his lifetime and early career with the Houston Rockets. Woody Williams, San Diego Padres, St. Louis Cardinals, and Houston Astros pitcher, resides in Sugar Land. Kevin Wu (aka KevJumba), YouTube celebrity/comedian, contestant on the reality show The Amazing Race. ^ a b c "Population History". www.sugarlandtx.gov. Retrieved April 4, 2019. ^ a b c "Geographic Identifiers: 2010 Demographic Profile Data (G001): Sugar Land city, Texas". American FactFinder. U.S. Census Bureau. Retrieved August 31, 2016. ^ "Press Room - Quick Facts". City of Sugar Land. Retrieved 2010-11-27. ^ "Sugarland". Tax Solution Store. Archived from the original on 2015-02-01. ^ "Documents". M. Campbell. Retrieved 2 May 2017. ^ "Website Access Suspended". www.hoatown.com. Retrieved 2 May 2017. ^ "Sugar Land, Texas, USA Weather Data". Climate-Charts.com. Retrieved October 9, 2012. ^ a b "2012 Fortune 500 List by Fortune magazine". Money.cnn.com. 2012-05-21. Retrieved 2012-06-24. ^ a b CVR Energy, Inc. Retrieved May 22, 2012. ^ "No. 5 public company: CVR Energy". Retrieved 2 May 2017. ^ Sarnoff, Nancy. "Burger King sniffing for new home / Houston said to be in running for headquarters' possible relocation" (Archive). Houston Chronicle. 3 February 2005. Business 3. Retrieved on January 13, 2009. ^ "Schlumberger to move U.S. headquarters to Houston". Houston Business Journal. Wednesday October 26, 2005. Retrieved on January 13, 2009. ^ "North America (NAM) Contacts". Schlumberger. Retrieved on January 13, 2009. ^ Mulvaney, Erin. "Schlumberger plans to relocate national headquarters to Sugar Land" (Archive). Houston Chronicle. October 5, 2015. Retrieved on October 24, 2015. ^ Dawson, Jennifer. "Minute Maid headquarters opens in Sugar Land". Houston Business Journal. Monday February 16, 2009. Retrieved on February 16, 2009. ^ "Deal of the Week / Cameron buys Galleria-area building". Houston Chronicle. Retrieved 21 December 2008. ^ Dawson, Jennifer. "Minute Maid gets $2.4M incentive for move to Sugar Land". Houston Business Journal. Monday January 21, 2008. Retrieved on February 16, 2009. ^ Bivins, Ralph. "BMC signs a big lease/Firm needs space until tower's done". Houston Chronicle. 17 November 1991. Retrieved on August 2, 2009. ^ "Comprehensive Annual Financial Report — Fiscal Year 2014–2015" (PDF). City of Sugar Land. February 2, 2016. Retrieved 2017-01-07. ^ "Form of Government". City of Sugar Land. Retrieved August 31, 2016. ^ "Statistics and Data". ICMA. Archived from the original on 2010-06-13. ^ Hall, Christine. "Sugar Land Town Square gets a 'heart' with addition of City Hall." Houston Business Journal. 15 April 2005. Retrieved on May 15, 2010. ^ "City Phone Directory". City of Sugar Land. 2003-05-16. Archived from the original on July 25, 2003. Retrieved 2012-06-24. ^ "Citizen's Fire Academy". City of Sugar Land. Retrieved 2012-06-24. ^ "City of Sugar Land". Archived from the original on 2007-07-20. ^ "Mayor & City Council - Sugar Land, TX - Official Website". www.sugarlandtx.gov. Retrieved 2 May 2017. ^ Finkel, David (April 26, 2004). "For a Conservative, Life Is Sweet in Sugar Land, Tex". The Washington Post. Retrieved May 24, 2010. ^ "About Pete [Olson]". Congressman Pete Olson. Retrieved 23 November 2017. ^ Schaller, Thomas F. (2015). The Stronghold: How Republicans Captured Congress But Surrendered the White House. Yale University Press. p. 173. ISBN 0300172036. ^ "Biography Ronald Ernest Paul". www.bioguide.congress.gov. Biographical Director of the United States Congress. Retrieved 23 November 2017. ^ "Rick Miller's Biography". Vote Smart. Retrieved March 1, 2014. ^ Nowell, Scott. "Doing Time" Houston Press. Thursday September 18, 2003. Retrieved on September 23, 2011. ^ "CENTRAL (C)." Texas Department of Criminal Justice. Retrieved September 14, 2008. ^ "Street/Address Locator". City of Sugar Land. Retrieved 2012-06-24. ^ Hanson, Eric. "Historic prison may be closed." Houston Chronicle. March 22, 2008. Retrieved on April 30, 2011. ^ "Sugar Land Distribution Center." Texas Department of Criminal Justice. Retrieved on May 22, 2010. ^ Ward, Mike. "Texas closing prison as part of cutbacks." Austin American-Statesman at KDH News. Wednesday August 3, 2011. Retrieved on September 23, 2011. ^ Maxey, Elsa. "Sugar Land Central prison unit to be emptied out by end of August." Fort Bend Star. Retrieved on September 30, 2011. ^ "Post Office Location - SUGAR LAND". United States Postal Service. Retrieved on December 6, 2008. ^ "Post Office Location - FIRST COLONY". United States Postal Service. Retrieved on December 6, 2008. ^ United States Census Bureau. "Census of Population and Housing". Retrieved June 14, 2013. ^ a b c "Profile of General Population and Housing Characteristics: 2010 Demographic Profile Data (DP-1): Sugar Land, Texas". American FactFinder. U.S. Census Bureau. Retrieved August 31, 2016. ^ "Selected Economic Characteristics: 2014 American Community Survey 1-Year Estimates (DP03): Sugar Land city, Texas". American FactFinder. U.S. Census Bureau. Retrieved August 31, 2016. ^ "Community Facts — 77479". American FactFinder. U.S. Census Bureau. Retrieved 2010-11-27. ^ Maclaggan, Corrie. "What Ethnic Diversity Looks Like: Fort Bend" (Archive). The New York Times. November 24, 2013. Retrieved on May 24, 2014. ^ "Find a Parish". Archgh.org. Retrieved 2012-06-24. ^ "Press Room - Quick Facts - Selected Census 2000 Information". City of Sugar Land. Retrieved 2010-11-27. ^ "Sugar Land Wins Fourth Straight "Fittest City in Texas" Title". Sugarlandtx.gov. Retrieved 2010-11-27. ^ "Sugar Land Stays Active to Three-peat as "Fittest City in Texas"". Sugarlandtx.gov. Retrieved 2010-11-27. ^ "City of Sugar Land Articles". City of Sugar Land. 2009-10-22. Retrieved 2010-11-27. ^ "Start Here! - Sugar Land Sharks". www.sugarlandsharks.org. Retrieved 2 May 2017. ^ "Official Website of the Sugar Land Skeeters". sugarlandskeeters.com. 2012-05-27. Retrieved 2012-05-27. ^ "Sugar Land Installs Donated Sculptures to Town Square Plaza" (Press release). City of Sugar Land. May 27, 2016. ^ Patrick Clarke (June 1, 2016). "Selfie Statue in Texas Sparks Backlash". ABC News – via WABC-TV. ^ Rob Walker (December 30, 2016). "The Year in Nine Objects". The New Yorker. ^ Jacob Brogan. "In Defense of the Controversial Selfie Statue in Sugar Land, Texas". Slate. ^ "Fort Bend County, TX : Commuter Park and Ride Services". www.fortbendcountytx.gov. Retrieved 2 May 2017. ^ Hensel, Bill, Jr. "2 foreign airlines curtailing Houston passenger service / High fuel prices hit carriers from Mexico, Taiwan". Houston Chronicle. Saturday January 12, 2008. Business 1. Retrieved on June 12, 2009. ^ a b "History." Fort Bend Independent School District. Retrieved on July 20, 2017. ^ "America's Top Public High Schools - The Daily Beast". Newsweek.com. 2009-06-07. Retrieved 2012-06-24. ^ a b Solomon, Jerome (August 28, 1997). "FOOTBALL 1997/HIGH SCHOOLS/FORT BEND BONANZA/Phillips, Dulles in hunt to add to town's memories". Houston Chronicle. Archived from the original on 2012-07-09. Retrieved December 31, 2011. ^ "History." St. Laurence School. Retrieved on March 30, 2019. ^ "Campus." St. Laurence School. Retrieved on March 30, 2019. "2630 Austin Parkway Sugar Land, TX. 77479"
^ Home. St. Theresa Catholic School. April 8, 2009. Retrieved on March 30, 2019. ^ "Fort Bend Christian Academy". ^ "Darul Arqam Southwest". Retrieved 2018-01-20. Quote "An AdvancEd accredited Islamic School in Sugar Land and a member of the IEIT School System." and "10415 Synott Rd. Sugar Land, TX 77498" However the school is actually in the Houston city limits. See map. From the City of Houston: "The U.S. Postal Service establishes ZIP codes and mailing addresses in order to maximize the efficiency of their system, not to recognize jurisdictional boundaries." ^ "The Sugar Land Express Gang". Texas Monthly. Slotboom, Oscar F. "Erik" (2003). Houston Freeways. Oscar F. Slotboom. 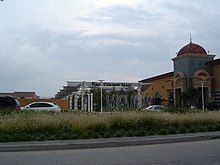 Wikimedia Commons has media related to Sugar Land, Texas. Sugar Land was a part of the Sugar Land Independent School District until 1959, when it merged into FBISD. Sections of Riverstone have Sugar Land postal addresses but are in unincorporated areas. This page was last edited on 22 April 2019, at 15:33 (UTC).